The Brown Recluse Spider, as its name indicates, has the ability of hiding inside homes, in the darkest and smallest places it can find. This species of spider normally attacks its prey by injecting venom along with its bite. The venom of this spider is powerful and it is used to kill other insects. In order to find this spider in its natural habitat, it should be first looked for beneath rocks and inside tree holes. This arachnid, however, benefits itself from human contact; this type of animal relationship is called "synantrophic". Since spiders have nocturnal habits, the human artificial light attracts them due to the large number of insects that normally gather around light bulbs, and so the brown recluse spider ends inside your home in search for them. 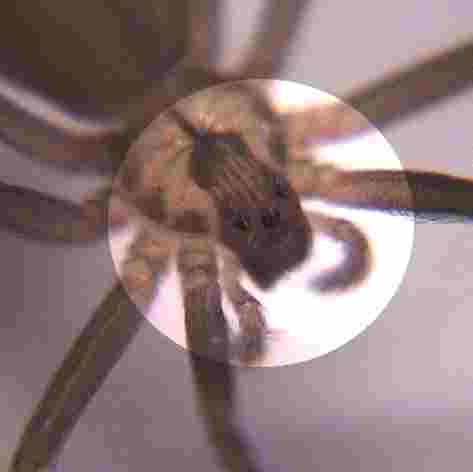 The brown recluse has no interest in humans whatsoever; its bite is always "unintentional", which means the arachnid will only bite when being threatened or accidentally touched. Use the menu on the left to learn more on this subject. Follow the links in the context menu for specific inside aspects of this specimen.